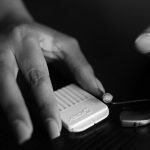 If you are a hearing aid user or know a hearing aid user, the chances are, you may have heard the annoying squealing a hearing aid can sometimes give off. This squeaking/squealing/whistling sound is what is called feedback. A hearing aid has both a microphone and a speaker. Each time sound goes to the hearing aid, the hearing aid amplifies the sound. The speaker then emits the amplified sound which can then picked up by the microphone in some cases. Feedback is simply the endless cycling of sound from the hearing aid speaker back through the microphones of the hearing aid. Typically, users will notice this sound as they insert their hearing aids after they have turned on or when they cup their hand over their ear. Sometimes a hearing aid user has significant high tone hearing loss which results in the hearing aid user not being able to hear the feedback. Others will often hear the feedback and inform the hearing aid user the hearing aids are squeaking/squealing/whistling. This is often embarrassing to the hearing aid user.